Lobbyists Reported Purchasing $821,640 In Food And Drink In 2017. For Most Of The Spending, The Public Can’t Tell Who Benefited. LANSING — The state lawmakers who serve in Michigan’s full-time Legislature apparently have full-time appetites. Lobbyists reported spending $821,640 purchasing food and drink in 2017. According to new disclosures, 30 lawmakers individually benefited from at least $1,000 in free food and drink last year. Three of them crossed the $3,000 mark. Under Michigan law, public officials can accept unlimited amounts of free food from lobbyists, and because of loophole- riddled disclosure laws, lobbyists can avoid reporting which lawmakers received free meals if they don't spend too much. Lobbyists’ food bill for 2017 is the second highest they have posted for a single year, according to disclosures maintained by the Michigan Secretary of State. The total came up just short of the record set in 2015 when lobbyists reported $837,967 in spending on food and drink. For comparison, 10 years ago in 2007, lobbyists reported spending just $628,997 on food expenses. 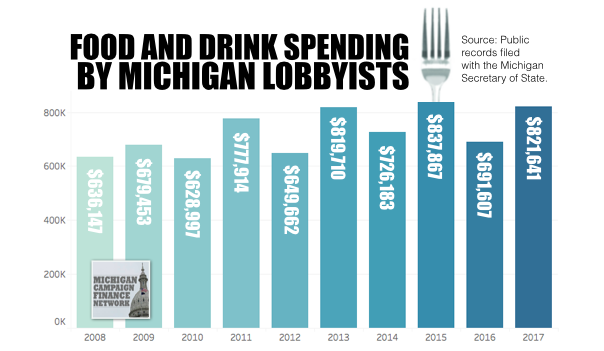 Lobbyists’ spending on food and drink tends to rise in odd-numbered years when new lawmakers are arriving in Lansing for the first time. So in 2017, for instance, lobbyists were working to get to know about 40 new House members who were elected for the first time in 2016. Some of that relationship building takes place over meals. However, it’s difficult to tell exactly how much lobbyists invested in buying food for freshman lawmakers. Lobbyists only have to disclose an official’s name in the reports if they spend more than $59 in a month or $375 in a year on food or drink for that official. Lobbyists also don't have to disclose how much they spent buying food for individual legislative staffers. Lobbyists reported spending $287,755 on food and drink for groups of officials in 2017. They disclosed spending $106,430 on food and drink for individual lawmakers who were identified in the reports. That could mean that about 52 percent of the food and drink purchases went to anonymous recipients. Which Lawmakers Got The Most Free Food? 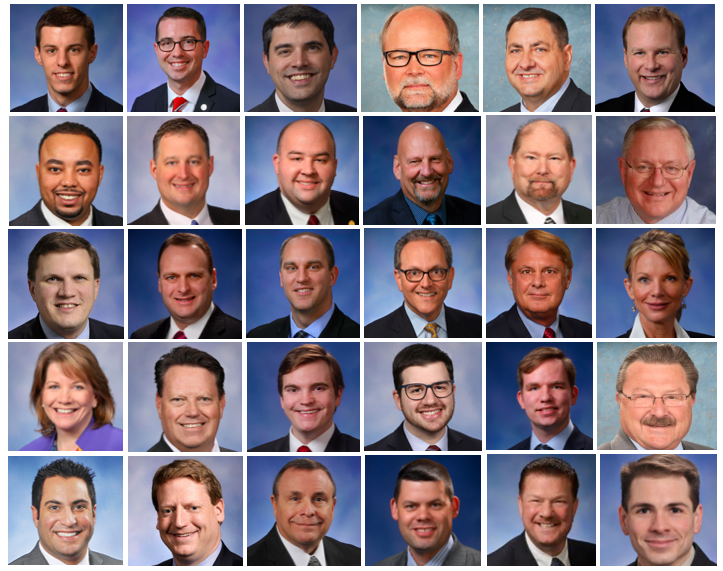 The three lawmakers who benefited the most from lobbyist food spending in 2017 were House Speaker Pro Tem Lee Chatfield, a Republican from Levering, Rep. Brandt Iden, a Republican from Oshtemo Township, and Rep. Jim Lilly, a Republican from Park Township, according to disclosures. Lobbyists reported buying at least $3,702 in food and drink for Chatfield, who chairs the House Republican Campaign Committee and is running to be the next House speaker. This is the second time in five years that a lawmaker from Northern Michigan’s 107th House District has led the list of top recipients of lobbyist-purchased food. Former Rep. Frank Foster, a Republican from Petoskey, came in first place in 2013 with $5,388 in food and drink. Chatfield unseated Foster in a Republican primary in 2014. Iden received at least $3,570 in food and drink. He chairs the Regulatory Reform Committee, which handles bills that regulate various industries. Lilly, a first-term lawmaker, received at least $3,301, according to the filings. A full list of disclosed recipients of lobbyist-purchased food and drink is available here. Of the 99 scheduled state House session days in 2017, an interest group or lobbyist reported offering food and drinks to groups of officials on 64 of them, according to disclosures. There were 171 group purchases of food and drink last year with 123 of them occurring on scheduled House session days. The largest spenders overall on group purchases of food and drink were the multi-client lobbying firm Kelley Cawthorne ($49,712), DTE Energy ($27,433), Consumers Energy ($25,920) and multi-client lobbying firm Governmental Consultant Services Inc. ($20,317). A full list of the group food purchases is available at this link.